Lawyers say economically stricken country’s purchase of horsehair wigs made in London evokes spirit of colonialism. Supreme court judges look on as Emmerson Mnangagwa is sworn in as Zimbabwe’s president at a ceremony in Harare in November 2017. 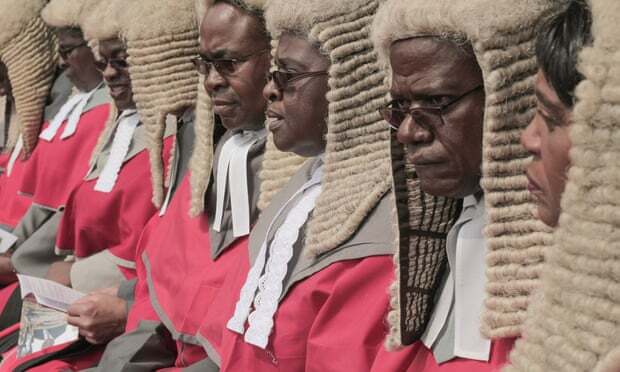 5 Apr 2019 – Lawyers in Zimbabwe have hit out at a government decision to spend thousands of pounds on wigs made in England for local judges, saying the tradition evokes a colonial past that should not exist in modern Zimbabwe. “In my view, it’s a bit unnecessary. From an ideological point of view, those wigs take us back to the colonial era. They make our courts inaccessible by the ordinary man. If the judicial services commission spends that money on rehabilitating dilapidated courts, that would make a lot of sense,” said Doug Coltart, a human rights lawyer.